Added the ability to edit a row of data after it has been added. See the screenshots section at the end of this post for what the interface looks like. All data except for the date can be modified. No more having to delete a row of data if you want to change a single item! When adding a new row of data the notes field will now have leading and trailing spaces removed. 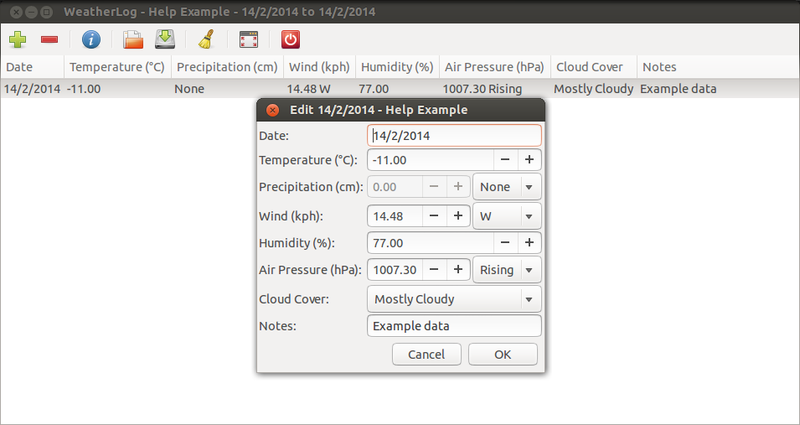 Fixed the wrong titles being displayed in the date chooser windows for selecting a range of data to show a chart about. Reload Current Data now shows a window saying that the data was reloaded. Reload Current Data now only prompts for confirmation if automatic saving of data is turned off. Rewrote convert.convert() to be simpler and faster. Merged all of the show_info_*() functions into one, called show_info_generic(). Merged all of the show_chart_*() functions info one, called show_chart_generic(). Downloads can be found on the SourceForge page, and the code is available on Github. Added the ability to select a range of data to show in the charts. Fixed a bug with selecting a range of dates where it would fail if the dates were in two different years. Re-organized some of the UI data to make it easier to update. Added charts. These are a new way to view temperature, precipitation, wind, humidity, and air pressure data. The charts show the date and value for each row, with the differences from the average, low, high, and median for that category. See the screenshots at the end of this post for more. Fixed a couple places in the code where I had copy and pasted a lot without updating the comments. Oops. It’s been accepted to the Firefox OS marketplace as well! Also, the code is available on GitHub, and if you want to use the app on a non-FirefoxOS mobile device it’s on GitHub Pages as well.